In Southern Italy a treasure trove of Roman, Mediaeval and Baroque architecture awaits, replete with spectacular castles, ornate churches and expansive art museums. Join Steven Miller, Head of the Art Gallery of NSW’s National Art Archive, for an exploration of this fascinating region. Begin in Bari, which combines Byzantine and Napoleonic history with a modern artistic fervour. Continue to the beautiful Baroque city of Lecce, and then visit Martina Franca, graced with Mannerist, Baroque and Rococo churches. Discover the ancient sassi (caves) of Matera, and the trulli (cone-topped houses) of Alberobello. Travel westward to the coast of the Tyrrhenian Sea and conclude in Naples, one of Italy’s great cultural centres, with visits to world-class churches, art galleries and museums displaying the treasures of two millennia of Neapolitan culture. Depart Australia or New Zealand in the late evening on suggested Etihad flights to Bari via Abu Dhabi and Rome. Renaissance Tours or your travel agent can assist you with your flights and other travel arrangements. Arrive in Bari in the afternoon on suggested flights and transfer to the hotel (transfer included in tour price). In the evening, join Steven and fellow travellers for welcome drinks, followed by a special welcome dinner. Begin the day with a talk by Steven, and then set out for a walking tour of the historic centre of Bari. Having been a major port during Roman times, Bari was brought within the political ambit of the Norman dominions in Naples and Sicily from the 11th century AD, and the old town retains much of the architecture of this period. Visit the Basilica of St Nicholas, a major pilgrimage site constructed in the 11th-12th centuries, the Church of St Gregory, the oldest consecrated church in the city, the Norman Castle built by King Roger II of Sicily and the Cathedral of San Sabino. Enjoy lunch at a local restaurant, followed by free time to continue your exploration of the energetic and dynamic city of Bari. In the evening, there is the opportunity to attend an optional performance at the Teatro Petruzzelli Opera House (to be confirmed, performance details to be announced early 2019; not included in tour price, additional cost applies). In the morning, visit the coastal town of Trani, with its magnificent Romanesque cathedral perched as a spiritual lighthouse on the edge of the sea. Built above a Roman catacomb, the cathedral symbolises the multi-layered history of this beautiful town. Trani also features a quaint Museum of the Typewriter, housing an exhaustive collection of typewriters from the 19th and 20th centuries, and the Synagogue Museum of Santa Anna, replete with Jewish art and artefacts testifying to the presence of lively Jewish communities in Southern Italy since the Middle Ages. After lunch at a local restaurant in Trani, continue to Castel del Monte, a defensive fortress built in the 1240s by Holy Roman Emperor Frederick II. The UNESCO World Heritage-listed fortress is unusual for being constructed in an octagonal shape with an octagonal tower on each of the castle’s eight corners. Return to Bari in the late afternoon. In the morning, check out of the hotel and travel to Lecce. After lunch at a local restaurant in Lecce, set out on a walking tour of the city whose abundance of Baroque sculptures has earnt it the moniker ‘The Florence of the South’. Thousands of years of human habitation and a naturally workable honey-coloured limestone known as pietra leccese (Lecce stone) have graced Lecce with monuments including a Roman theatre, a 16th century triumphal arch and several fine Mediaeval and 17th century churches. Check in to the hotel in Lecce in the afternoon, followed by an evening at leisure. Enjoy a morning talk by Steven, and then delve into Puglia’s rich history in the Faggiano Museum. The museum was created in 2008 from the private residence of restaurateur Luciano Faggiano, who had been digging beneath his floor to repair some sewage pipes when he uncovered layers of history stretching back more than 2,500 years, including the remains of a 16th century Franciscan convent, a 12th century Templar home and a treasure trove of historical relics from Roman times. Lunch and the afternoon are at leisure to continue your exploration of Lecce at your own pace. In the evening, there is the opportunity to attend an optional performance at the Teatro Politeama Greco Opera House (to be confirmed, performance details to be announced early 2019; not included in tour price, additional cost applies). Travel south to the town of Otranto near the tip of the Salento Peninsula, the ‘high heel’ of the Italian boot. Visit the distinctive 15th century Aragonese Castle, in the shape of a very irregular pentagon, commanding a port which has been home to Greeks, Romans, Ottomans and Siculo-Normans across the millennia of its existence. Also see the Cathedral of Santa Maria Assunta, where an enormous 12th century mosaic covering the entire floor has been described as ‘the Bayeux tapestry in stone’. Enjoy some free time in Otranto for lunch and then an afternoon at leisure to further explore this seaside town at your own pace. Return to Lecce in the afternoon. Travel to Martina Franca, a charming white city in the Murge Hills graced with a collection of Baroque and Rococo churches. Explore the Palazzo Ducale, where Late Mannerism gives way to the Baroque, and admire the façade of the Church of San Domenico designed by the Dominican Friar Antonio Cantalupi. Visit the Basilica of San Martino, arguably one of the finest examples of Late Baroque architecture in all of Puglia, whose richly embellished interior and exterior prefigure the development of the mid-18th century Rococo style. Enjoy lunch in Martina Franca, and then continue to the town of Grottaglie, a centre for the production of fine ceramics since the days of the Classical Greek settlements in Southern Italy. Discover how the limestone-rich geology of the Salentine Peninsula nourishes this ancient tradition with a visit to a ceramics workshop, and delight in the beautiful pottery which is so characteristic of Puglia. 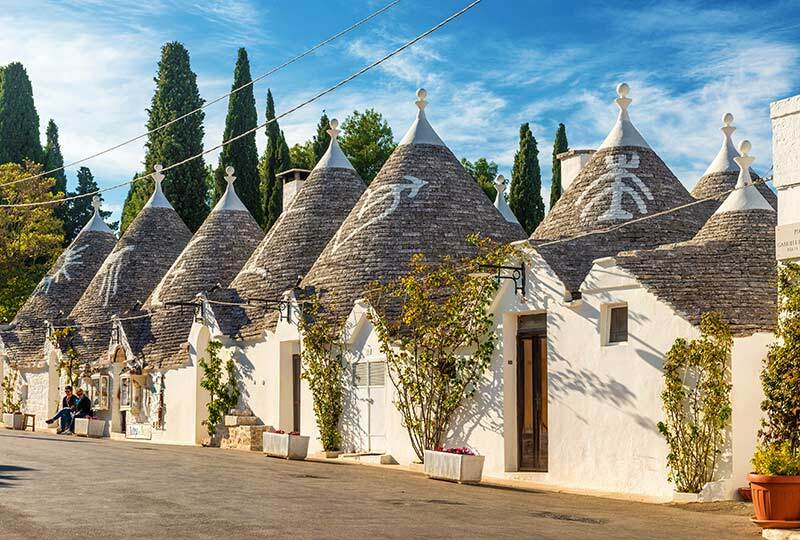 In the morning, check out of the hotel and travel to the UNESCO World Heritage-listed town of Alberobello. Alberobello is famous for its quaint trulli, whitewashed houses built with conical grey drystone roofs dating from the 18th century. Like so many good stories, the history of the trulli begins with a clever act of tax avoidance: by not using mortar in the building of the roof, the owner of the house could avoid the application of the imperial building tax, either because the residence was deemed ‘temporary’ or because it could be dismantled when tax inspectors were in the area. There are around 1,400 trulli in the town, and even the church is in the form of a trullo. Enjoy lunch in Alberobello before a walking tour of the trulli. In the afternoon, check in to the hotel, before an evening at leisure. In the morning, enjoy a talk by Steven and then travel to Matera to explore its fascinating sassi, an extensive series of cave-houses dug directly into the limestone hillside of Matera. The sassi were continuously inhabited for 9,000 years until the remaining inhabitants were moved into modern housing in the 1950s. In recent decades, the sassi have been carefully restored, and are now home to shops, restaurants and hotels. Enjoy lunch at a local restaurant in Matera, and then explore this historic town with a walking tour of the sassi. Return to Alberobello in the evening. Check out of the hotel in the early morning for a leisurely day’s travel westwards to Naples in Campania. En route, visit the Grotte di Castellana, an incredible limestone cave system formed 90 million years ago during the Cretaceous period. Journey onwards to Naples, and check in to the hotel in the evening, followed by dinner at the hotel. Begin the day with talk by Steven on the riches of Naples. One of the oldest cities in the world (and still the third largest in Italy), the area around Naples has been inhabited since the Neolithic period. Across the centuries, the city has been a paragon of Hellenistic culture in antiquity, the ‘intellectual capital’ of the Mediaeval Kingdom of Sicily and one of the centres of the Italian Renaissance. Explore the Capodimonte Museum, containing 13th to 18th century artwork by Masaccio, Botticelli, Rafaello, Bellini, Tiziano, Caravaggio, Vasari, Giordano, El Greco and Jacob Philipp Hackert. The extraordinary collection testifies to the wealth and influence of Naples throughout the centuries. After lunch at a local restaurant, enjoy the remainder of the afternoon at leisure to continue your exploration of Naples, with the option to visit the Palazzo Reale or the Galleria Umberto I. In the evening, there is the opportunity to attend an optional performance at the Teatro di San Carlo, Naples’s 18th century opera house (to be confirmed, performance details to be announced early 2019; not included in tour price, additional cost applies). In the morning, explore some of the treasures of ancient Italy in the Naples National Archaeological Museum. One of the world’s most impressive archaeological institutions, the museum contains the extraordinary Farnese Art Collection of works from Graeco-Roman antiquity, as well as many poignant casts made of the victims of Pompeii and decorations removed from the Pompeii excavations. A particular highlight is the series of astoundingly lifelike mosaics of Mediterranean sea-life, waterfowl and the denizens of the Nile River, rendered in carefully-observed detail. After some free time for lunch, visit the Cathedral of Naples, where the ceilings of the Royal Chapel of the Treasure of San Gennaro are adorned with spectacular frescoes by Domenichino and Giovanni Lanfranco, true masterpieces of the Neapolitan Baroque. Continue to the impressive Certosa di San Martino, a former Carthusian chapterhouse perched on the hill of Vomero overlooking the city of Naples. Return to the hotel in the afternoon, and then in the evening, enjoy a special farewell dinner with Steven and fellow travellers. Tour arrangements conclude after breakfast (late check-out included in tour price). If you are returning home today, make your way to Naples Airport for suggested Etihad flights to Australia or New Zealand via Rome and Abu Dhabi, departing in the evening. Renaissance Tours or your travel agent can assist you with your flights and other travel arrangements, including any extra nights’ accommodation, either before or after the tour.